This book about openings (fuseki), In The Beginning, is the first volume in the Elementary Go Series, published originally by Ishi Press and later republished by Kiseido. The author is Ishigure Ikuro. The cover illustration is problem 6 from the last chapter of the books. GoTraining: This book is excellent. I have read it and have gained a thorough understanding on building the foundation for my go. I'd recommend it for anyone 20k to 8k however, stronger players are bound to refresh from reading this. 10 whole board problems. In each of the problems, one move stands out as being significantly better than all others. The solution diagram assigns point values to a number of moves. 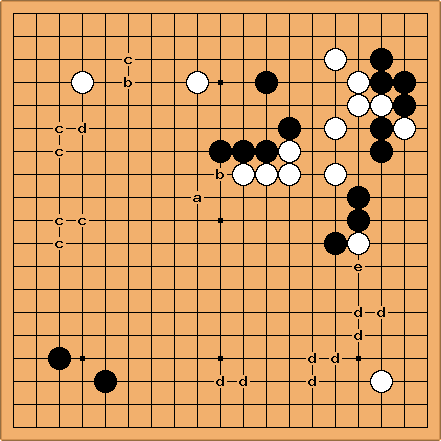 The correct answer is awarded 10 points, all other moves receive less, usually 8 or below. The focus of this problem is the pushing battle between the black and white groups in the center of the board. The book contains three pages of explanation with several diagrams regarding several of the moves indicated in the solution diagram.